Most people travel in small groups, with their spouse or with their immediate family. The nature of travel makes this the most conducive way to travel, since transportation and lodgings become more complicated and expensive as the number of travelers grows. For most groups which travel together, an organized travel company takes care of the lodging question. Hotels are booked, and the price is included as part of the travel package. In Israel however, extended families often plan vacations together, with the parents and their offspring, together with the offspring's spouses and THEIR offspring and given the fact that many Israeli families are large by Western standards, such a group can consists of several dozen people. These groups are always on the lookout for nice and inexpensive lodging options. In addition, it is not uncommon for Israeli schools to organize Shabbat get-aways for their students. The administrations have found that this is an excellent way to facilitate student bonding, as well as create a better connection between the students and staff. These schools also need to find accommodations which are pleasant and comfortable, yet can fit within their school's budget. In Tzfat, one excellent alternative for such groups is Achuzat Binyamin. 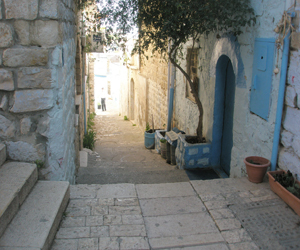 Achuzat Binyimin is located on the edge of the Artists Quarter, next to Tzfat's main commercial street, Jerusalem Street. It is a five-minute walk from the Old City of Tzfat, where all the synagogues are located, making it an ideal location for such groups who want to enjoy a Shabbat, or a few vacation days, together, within easy walking distance of the Jewish Quarter. Achuzat Binyimin offers nine apartments of varying sizes. Each apartment is spacious, with beds, kitchenettes, bathrooms/showers and lounging areas. Since the apartments are all located within one building, they allow families, school and other groups a pleasant alternative to a hotel for their Tzfat experience. All of the apartments are heated (winter) and air-conditioned (summer), and everything that is needed is located nearby - a grocery store, restaurants, coffee houses, and all kinds of shops and stores. There is ample parking near Achuzat Binyamin, making it particularly attractive for families who have young children and must bring a lot of supplies for their vacation. The apartments offer dining space, which gives several families the opportunity to gather together for meals during their stay. There is also a large roof area, offering a magnificent view of the mountains surrounding Tzfat, as well as the famous Mt. Meron Sunset. The evening breezes waft through the building and over the roof area, and guests enjoy sitting outside in the evenings to relax in the cool breezes for which Tzfat is famous.